When the TV Museum is finally in its new premises in Devon, these sets will all be on display properly. At the moment a lot of the sets are in storage, however, if you would like to see any of them in the flesh in Solihull, UK or if you have a pre 1970 colour set for sale, please email me at mike@tvmuseum.co.uk. 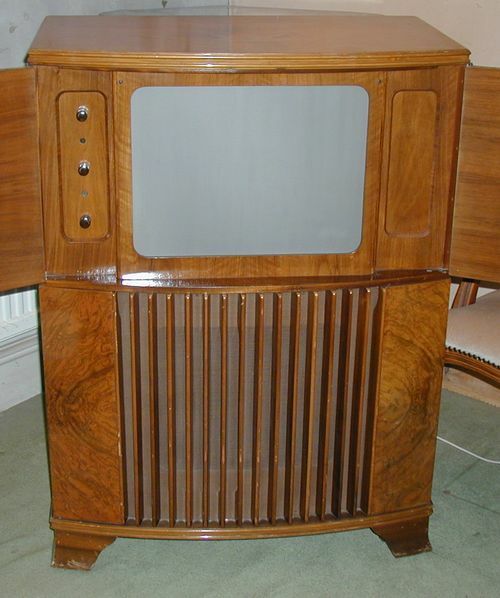 This set is a 1950 single channel Ambassador model TV2. The set is a very unusual shape and was designed to fit into the corner of a room. It uses a 12-inch Mazda CRM121 tube, although I suspect the emission is low as someone has fitted a heater booster transformer. The set isn't in top condition although it does look complete (apart from it's 2 back covers which are both missing.) The "Ambassador" badge is also broken on the front, and I would very much like to find a replacement. If you have one that you would like to sell me, I would be very happy. Please email me at mike.bennett@oldtechnology.net. Thank you. 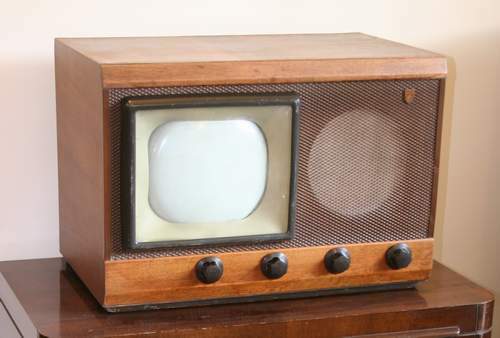 This set is a Bush TV12A from 1949. 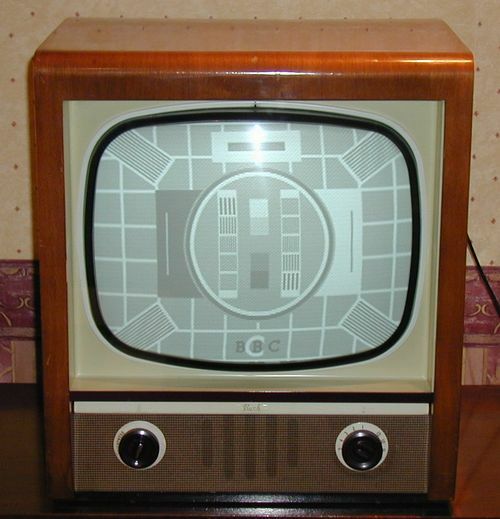 Although very similar externally to the slightly later and more common TV22, these sets seemed to me to be a bit more primitive and never seemed to work quite as well as their younger brothers - in my eyes anyway. The TV12 and TV22 are easily identified by the shape of the tube mask. 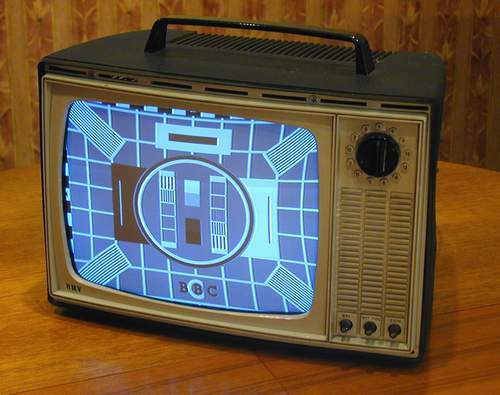 The earlier TV12 had a "squarer" looking mask because of the 5:4 aspect ratio which was then the standard. 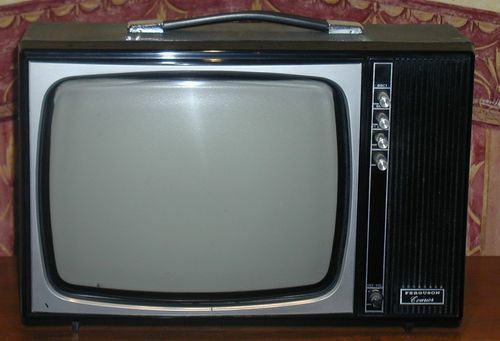 The mask on the later TV22 was curved at the left and right to allow for the later 4:3 aspect ratio. 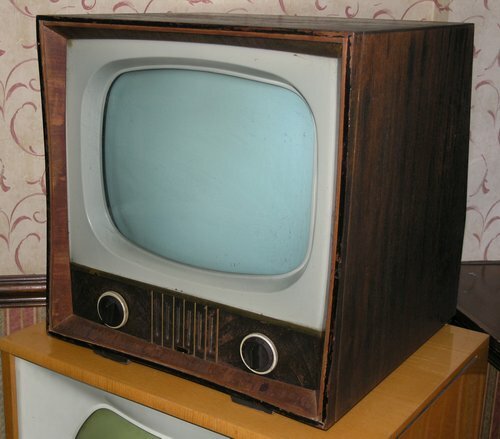 This next set is a 17-inch Bush model TV56 from 1955. This set has had quite a lot of restoration work carried out, although some of the rubber wiring is perishing badly and needs replacing. 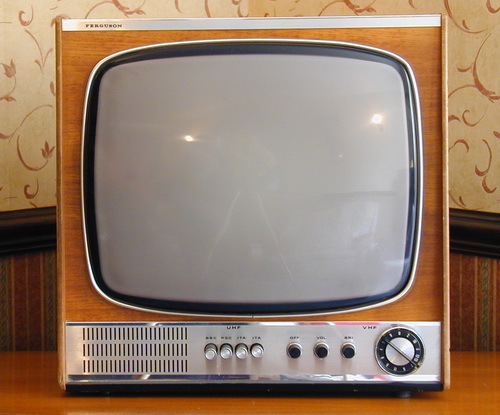 The Bush model TV66 looked almost identical to this set but used PVC wiring which didn't rot as badly as the nasty rubber stuff. 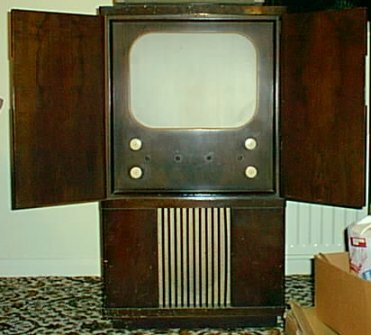 There was a 14-inch version of this set, the TV53 which had quite a nice looking rectangular tube with very flat top, bottom and sides. This set works very well, although the horizontal linearity needs a little bit of a tweak and there are a few components which it would benefit the set to change. The next set is a 1948 Ekco 9" model TS46. I bought the set from a chap in Shropshire after it failed to sell on ebay. The cabinet looks as though somebody has tried to tart it up a bit with liberal applications of wood "stopping" filler and varnish. The insides look as though they've had the same treatment, with various components missing including the original combined on/off switch and volume control (which has been replaced by a pot with no switch). Various other electronic components have been removed too, no doubt to provide spares for other sets, but all this stuff (including the cabinet) can be sorted out and I'm quite sure the set will live again. This next projection set was very kindly donated by a great chap called Tim Collyer and his family in loving memory of their relative Jessie Harvey whom the television belonged to from new. Many thanks Tim and family - it's a superb set and it'll be getting attention soon. The set is a Decca model 131; these sets are fairly common as far as projection sets go, but unfortunately a lot of them are not in as good condition as this one which has been very well looked after. Many of these sets were also fitted with a 3 band radio which slotted into the panel on the right hand side. This set is in excellent condition internally and externally and shouldn't be too difficult to restore. The set also came with its original operating instructions. Fantastic. This is a Ferguson 3652 and utilises the Thorn 1400 dual-standard (405/625 line) chassis. I've had this set longer than almost any set I can remember but I haven't the slightest idea where it came from. It's a bit tatty round the edges but it just seems to go on and on. This set is a Ferguson 3805 "Courier" and utilises the hybrid (valve and transistor) Thorn 1580 chassis. This set looks almost identical to the newer Ferguson 3816 (see Gallery Page 2) but the newer set is fully transistorised and can be operated on a 12 volt power supply, whereas this set is mains-only. 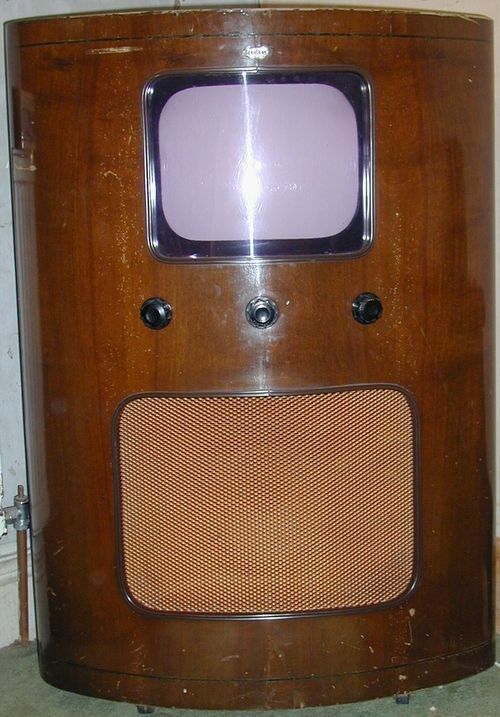 This next TV was a total wreck when I was given it several years ago; it's a 1938 GEC BT9121. As the set was in such a poor condition and missing so many parts (mechanical bits, CRT etc.,) I thought I would let Andy Beer have it as he has far more patience (and skill) than I have and if any one could get it going, it was Andy. He is having a new cabinet made for the set using dimensions supplied by the Alexander Palace Television Society and pictures of the old cabinet (which unfortunately got thrown away). The set was very kindly given to me by a late friend, Bob Cook from Exmouth. NB. The set has now been passed on by Andy to another pal of mine, David Boynes in Newcastle, who has now finished making a new cabinet and is well on the way to finishing the electronic restoration - no mean feat at all considering what a huge job this is. This set is a 1966 HMV 2634 "Imp" and uses the Thorn 980 chassis, HMV's last single-standard 405-line-only chassis. The set is identical in all but colour to the Marconi 4634 "Mini", the Ferguson 3639 "Junior 12" and the Ultra 6641 "Cub". The set works pretty well after a reasonable amount of work, although the scan coils are falling out of their enclosure causing the pincushion distortion shown in the picture. The set is now owned by my mate Tas in St. Albrans. This next set is a 1956 Pilot TV107. It was donated by a very nice lady in Bristol called Cynthia. Thanks Cynthia - It's excellent and will be very well looked after. 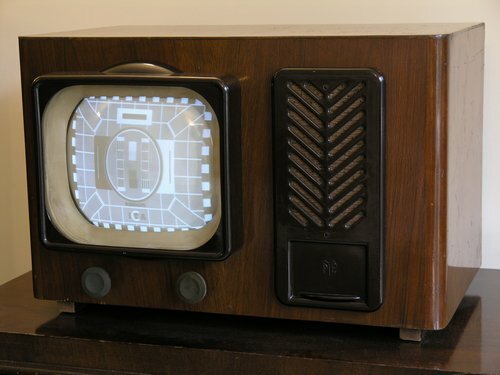 Many years ago this 1959 Philips 21-inch TV model 21TG100 was used in my living room as my everyday set (through a remote-control extender, a remote control video and a "Dinosaur" 625-405 line standards converter.) 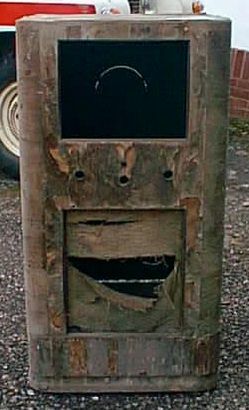 It came from a second-hand shop on the A377 between Exeter and Barnstaple in 1998. A sign on the top said "10 Pounds - Probably Still Works." It didn't, although it didn't need an awful lot of work to get it going. 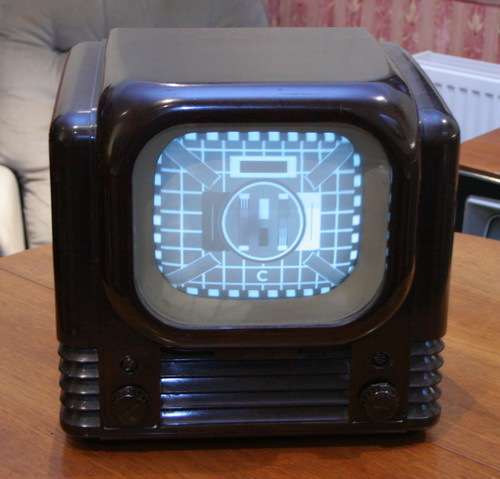 The PL81 cathode resistor had gone open circuit, and the usual replacement of capacitors in the frame stage produced a cracking picture and the set is still working exceptionally well today. The next set is a 1947 Pye model B16T. 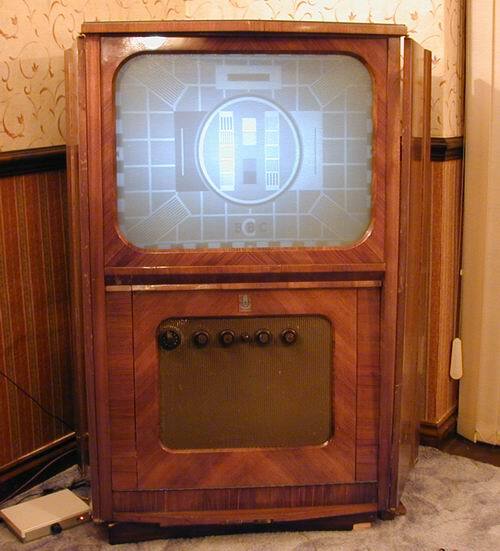 These sets were produced from 1946 and were the first TV that people could buy after the war. I bought this set from a pal of mine called Peter in Devon. Peter had done quite a lot of work to get the set going so it only needed a few tweaks and niceties from me to tart the set up a bit. As well as a couple of valves, I've had to replace some rubber wiring and a few other components, although there a still one or two faults that I need to iron out to get the set tip-top again. Thanks Peter - It's an excellent set. Here's another old projection set that a very nice man called Fred from Bristol gave me. It is a Stella ST1481A. It has been dismantled internally and will need quite a bit of restoration to get it going again. Next is a White Ibbotson 2418 projection set that I bought from a very nice old couple from Weston-Super-Mare. It had originally been bought by them from a hotel and was used regularly until it got relegated to the back room. The bottom section where the castors are got very wet in storage and needs replacing, but I suspect that this is a fairly simple job for a carpenter. 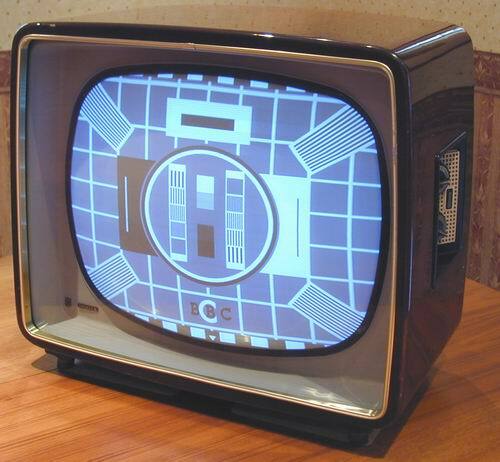 A band-3 tuner has been fitted to this set but this will be removed as soon as I get round to restoring the set. The model numbers of White Ibbotson sets refer to the size of the picture produced - in this case "2418" indicates that the picture size is 24 inches by 18 inches.